(WASHINGTON, DC) – The Partnership for the 21st Century Conservation Service Corps (21CSC) today announced the 2019 recipients of the 21CSC National Distinction Award and Champion of the Year Award. Honorees will be recognized during the annual Partnership for the 21CSC meeting, taking place February 11, 2019 in Washington, DC. This meeting is part of The Corps Network National Conference. The 2019 National Distinction Awardees are Lisa Norby, soon to be retired Energy and Minerals Branch Chief, Geologic Resources Division, National Park Service; and Greg Sanders, Job Corps and Veterans Fire Programs Workforce Program Manager, U.S. Forest Service. The 2019 Champions of the Year are Tate Thriffiley, Ecologist, De Soto National Forest, U.S. Forest Service; Jennifer Wheeler, Botanist, Arcata Field Office, Bureau of Land Management; and Craig Young, Terrestrial Program Leader, Heartland Inventory and Monitoring Network, National Park Service. The 21CSC is a bold national effort to put thousands of America’s young adults and veterans to work protecting, restoring and enhancing our communities and natural spaces. At the heart of the 21CSC are over 230 nonprofit and government-operated “Corps.” Corps are organizations that – through partnerships with resource management agencies, conservation organizations, and the Corporation for National and Community Service – annually engage roughly 25,000 young people and veterans in maintenance, improvement and disaster response projects in communities and on public lands and waters. The existence of the 21CSC depends on partnerships between Corps and project partners that are committed to engaging young adults in the preservation of America’s natural, historic and community treasures. The 21CSC Champion of the Year Award recognizes individuals from partner organizations – including nonprofits and government agencies – who have gone above and beyond to engage Corps and support the training of the next generation of resource management professionals, community leaders, and outdoor recreationists. Champions are selected through a nomination process. This is the fifth year the Partnership for the 21CSC will present the 21CSC Champion of the Year Award and the fourth year for the National Distinction Award. The Champion of the Year Award recognizes regional leaders; the National Distinction Award recognizes leaders whose work has touched 21CSC organizations across the country. Led by The Corps Network and Conservation Legacy, the Partnership for the 21CSC is an advisory group of key federal, state, local and nonprofit leaders that support the development and implementation of the 21CSC to reach its goal of being a preeminent strategy for addressing America’s most pressing conservation and disaster response needs. In addition to honoring the 21CSC National Distinction Awardees and Champions of the Year, the 2019 Partnership for the 21CSC Meeting will feature remarks from, among others, Holly Bamford, Chief Conservation Officer, National Fish and Wildlife Foundation; Ray Foote, Vice President, National Forest Foundation; Will Shafroth, President & CEO, National Park Foundation; and Elamon White, one of The Corps Network’s 2019 Corpsmembers of the Year and an AmeriCorps alumna of Mt. Adams Institute. The 21st Century Conservation Service Corps (21CSC) is a bold national effort to put thousands of young people and veterans to work protecting, restoring, and enhancing America’s great outdoors. The 21CSC is based on public-private partnerships between federal resource management agencies and the private sector. The goal of these partnerships is to increase civilian national service positions on public lands and encourage the use of Corps to meet the maintenance needs of land and water management agencies at no additional cost to taxpayers. Learn more at www.21CSC.org. Established in 1985, The Corps Network is the national association of service and conservation Corps. 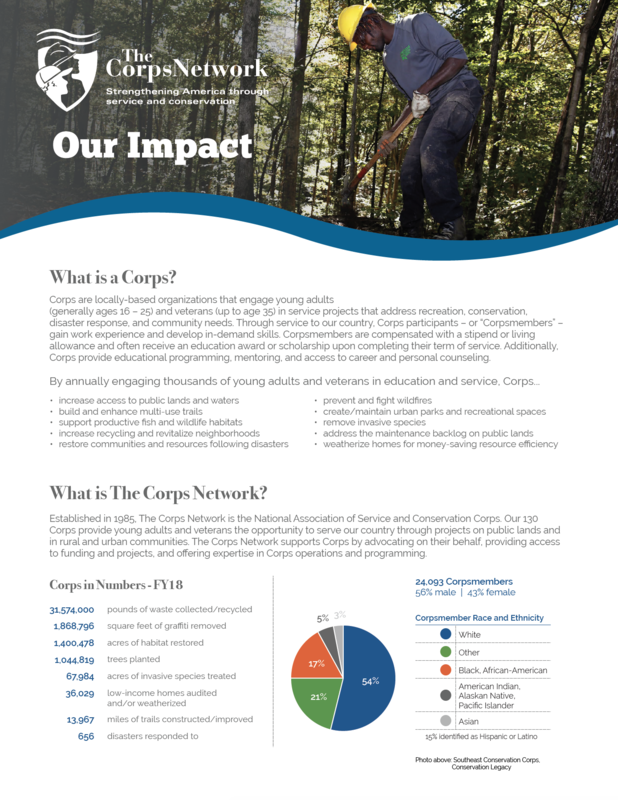 Our 130+ member Corps annually provide over 25,000 youth and veteran Corpsmembers the opportunity to serve our country through work-based conservation, resource management, lands access, recreation, and disaster response projects on public lands and in rural and urban communities. Through their service, Corpsmembers obtain in-demand skills and advance their education. The Corps Network supports Corps by advocating on their behalf, providing access to funding and project opportunities, and by offering expertise in Corps operations and programming. Learn more at www.corpsnetwork.org. Conservation Legacy is a national organization dedicated to supporting locally based conservation service programs. We operate and support programs that provide service and work opportunities for a diverse group of individuals to complete important conservation and community projects for the public benefit. Founded in 1998 to continue the legacy of the Civilian Conservation Corps of the 1930s, Conservation Legacy programs include: Southwest Conservation Corps, Great Appalachian Valley Conservation Corps, Southeast Conservation Corps, Arizona Conservation Corps, Preserve America Youth Summit and BRIDGE Network.